The Appaloosa is another US breed that has a breeders' movement to preserve "old style" bloodlines. 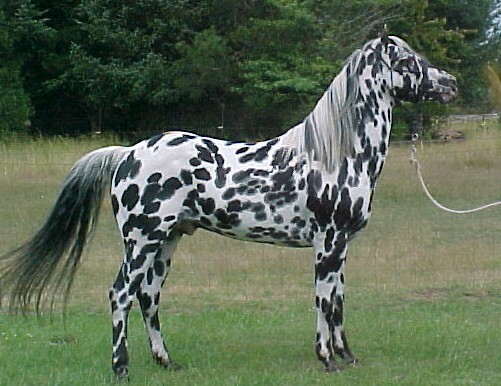 The Appaloosa was originally a Native American breed, developed by the Nez Perce tribe, and known for its versatility, athleticism, and of course its unique color patterns. Nearly lost after the destruction of the Nez Perce herds by the US government in the 1870s, the Appaloosa was "rebuilt" from surviving spotted horses in the 1930s. However, in terms of registration, color was often taken as the most important factor, and horses that were a mixture of breeds were counted as Appaloosas. Even today, crossing with Quarter Horses and Thoroughbreds is allowed. Foundation breeders try to preserve the Appaloosas with the least cross breeding. Interestingly, Appaloosa coloration passes on to offspring on a continuum (I've lost the reference for this - I'll add it when I find it!). A leopard App crossed to a solid colored horse will probably produce a strongly marked foal. But an App with a just small white blanket marking cross to a solid colored horse may or may not pass on visible Appaloosa characteristics. For an overview of the characteristic coloration of Appaloosas, check here. The stunning stallion in the photo is Pratt Sully Fire, a leopard stallion at Decker's Red Eagle Appaloosas. There seems to be a tendency to the leopard pattern in the foundation Appaloosas, and also, sometimes, a tendency to be easy-gaited - these gaited horses are sometimes called "Indian Shufflers." There is another beautiful foundation stallion here.